�A Tough and Classy Wood Chess Set! This stout, hand-carved wooden chess set features a 3.75" king with a 1.5" diameter base and weighs an impressive 34 ounces. 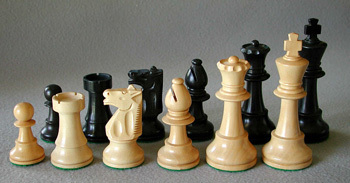 A House of Staunton original, the Club Series Chess Set features a very robust design with thick collars and no "delicate" part-details to chip or break during hard usage. This is unquestionably one of the most robust wooden chess sets that you can buy! One of the heaviest wood chess sets of its size on the market, it is designed to withstand the rigors of practical play while maintaining the elegance that has become the hallmark of all House of Staunton sets. The design and feel of these chessmen make them ideal for both Tournament and Rapid Play (Blitz) Chess. Each set consists of 34 pieces, 16 light and 16 dark; and includes 2 additional queens.